Founded in 138 B.C. by a small band of Roman soldiers, Valencia has been sacked by the Visigoths, conquered by the Moors and re-conquered, in 1238, by Spanish King Jaime. It was forged as a prosperous trading center in the 15th century, expanded by returning Spanish Colonials in the late 19th/early 20th , then again redefined by modern hydrology and architecture. This charming city, a study in contrasts, is fine-tuned to high-wire transformations and multiple reinventions! Valencianos, friendly and welcoming, are fiercely proud of their city and ancestry. A trip here offers engaging explorations of past treasures, current innovations and ambitious plans for the future. The River doesn’t flow there anymore. Torrential rains in the fall of 1957 caused the river Turia to overflow its man-made channel. Disastrous floods swamped much of the city. To prevent a nasty repeat, the municipal administration came up with a totally remarkable idea: don’t move the city, move the river! In 1963 this hydrological master-stroke diverted the Turia to a new channel outside the city, leaving behind a dry river bed. En route from the airport, the dry channel is candidly ugly, bedecked with graffiti. But approaching city center, the scarred terrain takes on new life--emerging as a crescent shaped park with gardens, ornamental pools (some with synchronized sound-and-light fountains) and venues for baseball, soccer and rugby. Locals flock here in the evenings to exercise – jog, bicycle, roller-blade, dog walk. Elegantly dressed concert goers from the Palace de Musica add polish to the bustle. 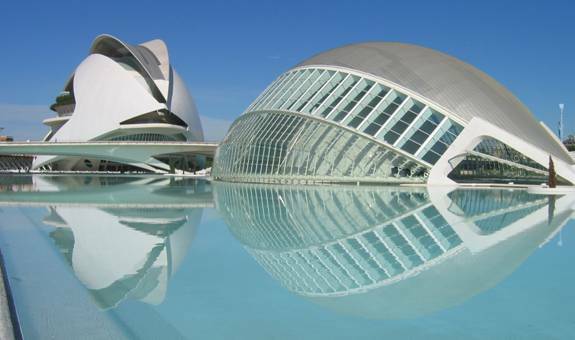 Heading towards the coast, the startling uber-contemporary architecture of world- renowned native son, Santiago Calatrava, makes a dynamic futuristic statement. Several kilometers of river bed between this complex and the Port of Valencia await a final plan and financing, but tall office buildings are envisaged. The riverbed can be crossed at level in various places or via bridges both old and new. Rather than dividing the city, this spine of activity now unites it. Traces of Valencia’s history dot the very walkable old city, merging ancient roots with the today’s sunny, modern town. Roman remains mark Sagunto, north of the city. Two of the massive gates of the old Moorish city wall still stand. Narrow cobblestone streets meander maze-like through the Medieval Old Town. The Cathedral, built on the site of an old mosque, dates essentially from the 13th century, with later additions introducing Romanesque, Renaissance, Baroque and Neoclassical. 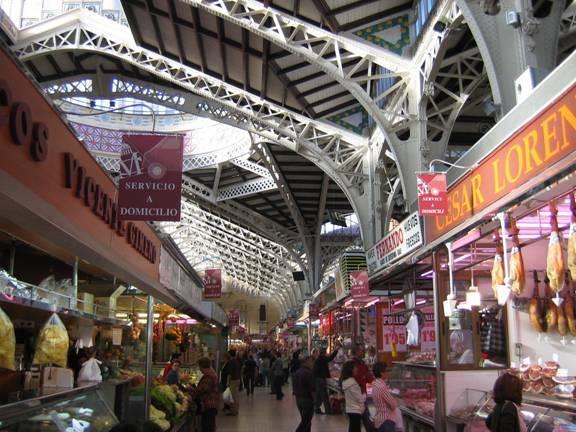 The Mercado Central, one of the world’s largest and most magnificent covered markets, is where Valencianos shop. Graceful Art Nouveau wrought iron supports the soaring space. Colorful local tiles enliven the walls, and white tiles lay an impeccably clean, litter-free floor. The Estacion Del Norte train station provides another wonderful example of Modernism, the Spanish term for Art Nouveau. Heralding the new is Santiago Calatrava’s massive City of Arts and Sciences--the Palau de les Arts (Opera House), with a roof that appears suspended in air; the eye-shaped Planetarium and Omnimax theatre; the Science Museum; the Aquarium; and the newly completed Agora, a Sports and Performance Center that opens like a giant clam. This highly personal work bridges architecture, structural engineering and sculpture. It also bridges today’s achievements and tomorrow’s possibilities. Orange trees were introduced to Valencia during Moorish rule, but as a purely decorative landscape feature. It is not entirely clear when Valencianos turned to cultivating oranges as food and beverage, but the fruit is now synonymous with the region. 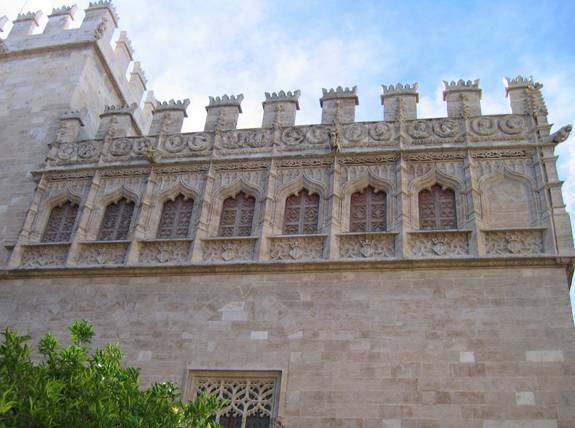 The city has also flourished in trading silk, rice, olives and ceramics. The Port of Valencia is still very active--though its most important recent development came with the 2007 America’s Cup and the accompanying effort to spruce up the city. In its wake are the large warehouse-style buildings constructed for each of the competing teams. This year, in February, the race returned, and the port area will also host a Grand Prix motor racing event. Richly diverse neighborhoods shape the city. The landmark octagonal bell tower, El Micalet, marks the pretty Plaza de la Reine and the spectacular Valencia Cathedral. Built on the site of a major mosque and dedicated to the Virgin Mary, the imposing church references many different architectural styles-- though it is essentially Gothic. 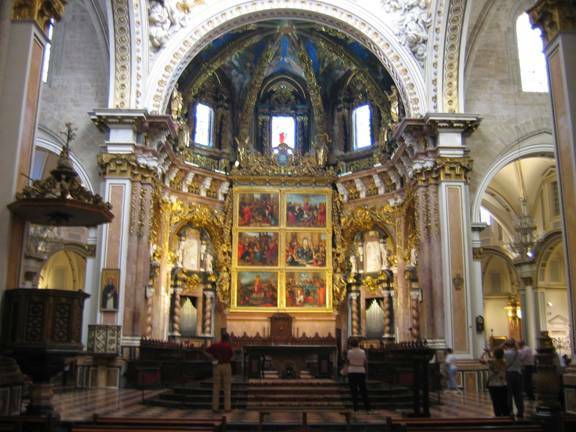 The interior houses a magnificent alter, important art including Renaissance frescoes and works by El Greco and Goya. The big draw, though, is the Holy Grail, claimed to be the chalice used by Christ at the Last Supper. 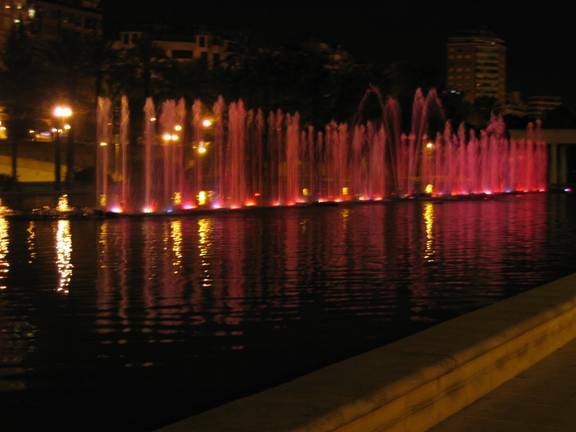 Valencia night-life centers on the adjacent El Carmen quarter, where many bars and small restaurants flourish. 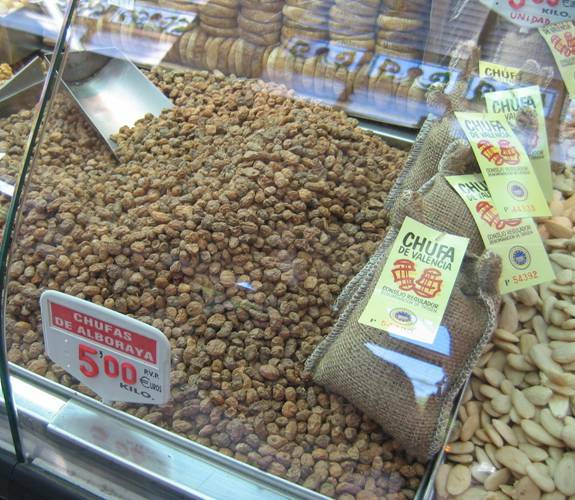 The area also hosts daytime social hubs--particularly Horchaterias, shops serving Horchata, a specialty sweet beverage made from local Tiger Nuts. 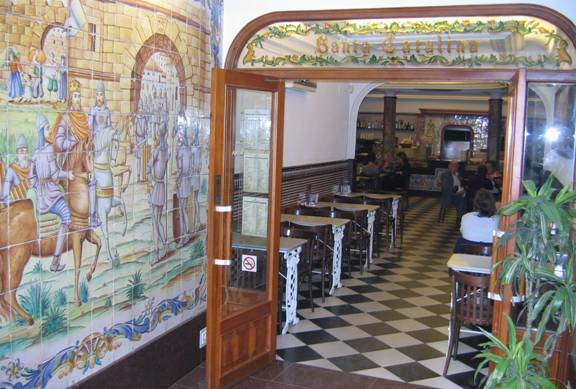 One of the most famous, Santa Caterina has a tiled wall in the entry depicting King Jaime’s re-conquest of the city. The quirky Plaza Redondo is a round square--two concentric rings of wooden multi-story dwellings, with shop fronts at ground level. The market, especially lively on Sundays, sells local Valencian goods, cloth, sewing supplies, religious artifacts and household items. Outside the old walled city is Valencia’s Eixample—“expansion”-- the area where wealthy colonialists, returning from Spain’s lost empire in Latin America, built magnificent homes, rivaling the palaces of the established nobility. The Eixample has many splendid Modernist buildings--including the dramatic Mercado Colon, with its preserved original exterior and carefully renovated interior of stylish shops and bars. Adjacent to the Port, narrow streets of small houses, once home to seafarers and Port workers, mingle with newer, generally unattractive apartment buildings. Allow time to roam the Modern Museum District. From the glittering Opera House and Planetarium to the Agora, the Calatrava-designed structures amaze with their creativity and monumental scale. While costly and aggressively futuristic, Valencianos are proud of this development, recognizing it as a bold lure to world attention and tourism. Stroll the entire length, going one way at street level and back along the lower level of reflecting pools. The Science Museum has excellent interactive exhibits for children, as well as instructive displays about such subjects as earth science and global warming. 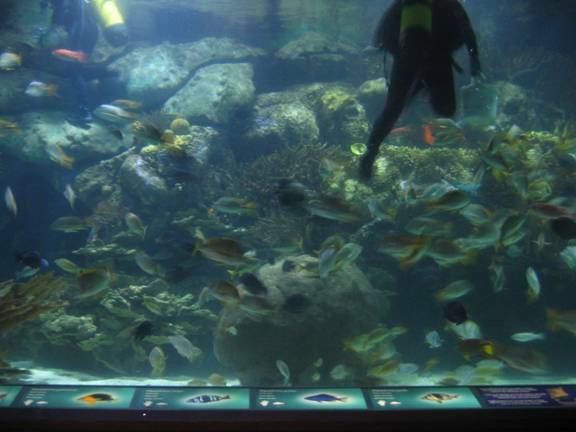 The Aquarium, claimed to be the largest in Europe, has both underground and above ground sections dedicated to marine life from several of the world’s seas and oceans. Riso, rice, in Valencia refers to Paella, a rice and saffron-seasoned dish invented here, or to a variation--rice cooked with something else, taken as a main course or the second of three courses. Rice incarnations appear on most menus. But seek the ultimate paella experience at La Matandeta, located outside the city among the rice fields of the Turia river estuary and nearby lagoons. Chef-owner Rafael Galvez cooks it authentically—outdoors on a wood-fired grill, using ground water from local wells and combining traditional ingredients--either meat or seafood, not in combination. Meat-based Paella generally includes chicken, duck, rabbit and possibly snails. Seafood-based combines assorted fish and shellfish. Perfectly cooked paella delivers barely moist—not soupy--rice, with each golden grain intact. The dish is presented at table in its large cooking vessel. There’s delicious variety in Valencia’s restaurant scene, where wonderful products highlight menus. Near the port, behind a Modernist façade stands iconic Casa Montana. Originally a wine bar, with huge barrels of bulk wine and a few tapas offered to patrons, it now features several small rooms with restaurant seating behind the original shop, plus a large tasting room. The menu remains traditional tapas but of notably high quality. Diners frequently combined small plates into a multi-course repast, matched to amazing wines by the glass. Alexandro Garcia, son of the founder is an extraordinarily knowledgeable tasting guide. The rustic, congenial ambience attracts local regulars. Pricing is modest. The place is packed at peak time, 10-11 p.m.
Valencianos and tourists flock to the city’s broad, sandy beaches, especially on Sundays. On the Playa de la Malvarrosa, a row of restaurants serves terrific traditional fare. 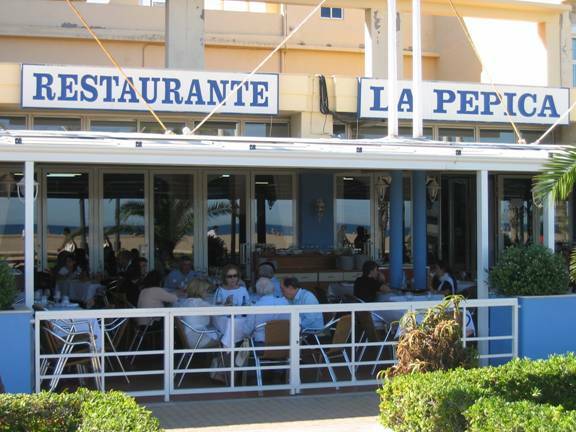 Most famous is La Pepica, founded in 1898. Here specialties span riso and seafood, especially shellfish, emanating from the busy kitchen. An energetic waitstaff flies through service. The spirits of Ernest Hemingway, a Pepica habitué, and numerous other luminaries preside over the boisterous scene. The founder’s grandson now runs the restaurant that began as a beachfront dining shack, a “chiringuito.” Sunday lunchtime is Pepica’s most popular meal. Outdoor tables go quickly, so make reservations well in advance. The modern wave of Spanish cuisine, spawned by famed Catalan molecular gastronomist, Ferran Adria, also has outposts in Valencia—though flavors are rarely sacrificed to kitchen science. Audacious Chef Raul Alexandre, an El Bulli alum, has transformed Ca Sento, the seafood restaurant founded by his mother, into a temple of modern gastronomy—cod doughnut, hot and cold oyster, anchovy in foam. The small dining room, with arresting décor, frequently sells out for dinner. Try lunch, starting at 1.30 p.m. 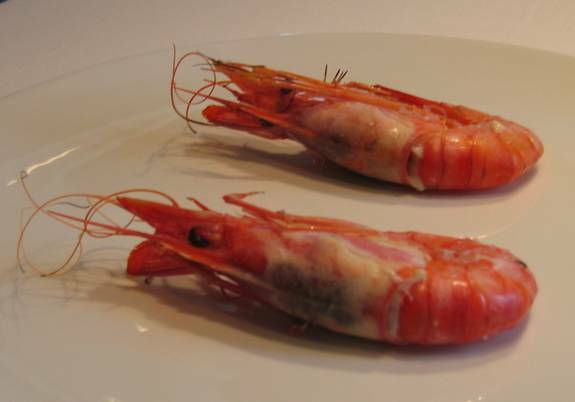 Famous Red Prawns from nearby Denia are a frequent special. While the original Arrop still operates in nearby Gandia, Chef Ricard Camerana and his wife just opened a second venture: aRC (Arrop Richard Camerana), Valencia’s newest and smartest restaurant. The rough stonework of ancient foundations, unearthed during the building’s construction, contrasts stunningly with the otherwise sleek, contemporary interior. Camerana aims to revitalize the traditional kitchen with intensified creativity. One curious signature: snail rice without snails. Inside the Institut Valencia d’Art Modern (IVAM), La Sucursal boasts stylishly minimalist décor and innovative food, see marvelous seafood above. The kitchen executes a menu of modern but not whacky dishes. The chef’s known for “soupy” rice—especially a lobster-embellished one. 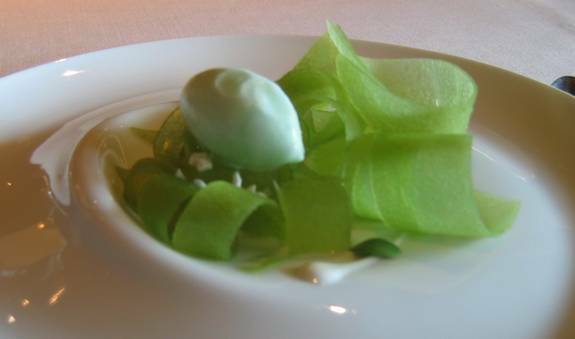 Presentations are artful as befits the setting, the green apple dessert being a good example. 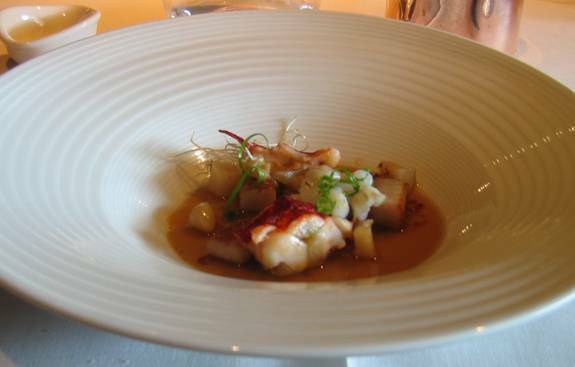 Visionary Chef Quique Dacosta is widely recognized as a genius, one of the great chefs of Spain. Going to his namesake restaurant—formerly called El Poblet--in Denia, 100 kilometers south of Valencia—is akin to making the El Bulli pilgrimage. Dining here is an adventurous experience. 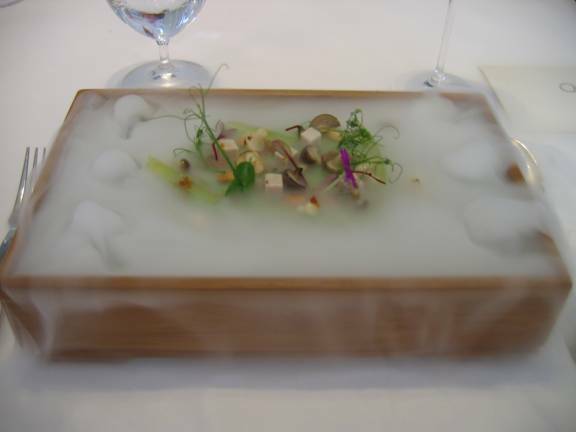 The perfectionist chef, guided by a brilliant intellect, fearlessly fuses abstract concepts, concrete flavors and futuristic technique, this “Haze” salad being a good example. Two Denomination of Origin (DO) regions locate here. Despite an inland hilly area, the Valencia DO has a Mediterranean Sea-facing aspect that provides favorable microclimates. Many varieties of grapes flourish—especially Garnacha and Monastrell, aka the southern Rhone’s Grenache and Mouvedre. Popularly-priced, these wines are mostly red, alongside some light, fresh, low-alcohol whites. Bodegas Los Frailes, a property owned by the Velasquez family since the 17th century, demonstrates rapidly increasing quality. Serious, all-organic wine making began 10 years ago, though 80% of these wines are exported. The Utiel-Rquena DO, named after the two largest villages, lies west of Valencia at higher elevation. The dominant grape variety, Bobal, is native to the region. Production consists of bold, dark reds, some roses and creditable sparkling Cava. In a country known for its unique fiestas, Las Fallas stands out as the craziest. To mark the arrival of spring each year, from March 15th to 19th, Valencia really lets down its hair. During the year, local communities, called fallas, construct colorful wood and papier-mache figures and symbols, called ninots (puppets or dolls), some as high as 25 meters. Satirical in content, the figures frequently represent unpopular individuals, politicians, even US presidents. At festival time, over 700 ninots parade the city, accompanied by fireworks, carnivals, traditional dress, music and nightlife. 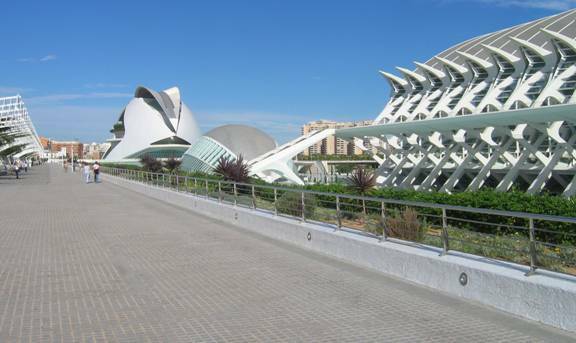 The festivities attract enough visitors to swell Valencia’s population three-fold. Fireworks are planted inside the figures, and all goes up in flames on the last evening—except for one, selected by vote, which survives to enter the Falleros Museum. No airline flies direct from the US to Valencia. But major European airports--London, Paris, Madrid--have connections on Iberia and Spanair. Also, various low-cost European airlines offer service from smaller airports. A taxi to city center, usually a 30-45 minute ride, costs about 25 Euros. With heavy traffic, confusing road patterns and narrow streets, don’t rent a car unless necessary for excursions. The Valencia Tourist Card, available for 24, 48 and 72 hours--10, 16 and 20 Euros respectively--buys use of an Audio guide, free public transport and discounts at some museums, shops and restaurants. The old city center harbors many small hotels, but the better large hotels locate just across the river bed. One good choice: The Melia Palace couples outstanding service with convenient access to the parks and buildings along the river bed. (There’s another Melia Hotel in the center, so clarify your destination to the taxi driver.) Other hotel possibilities: Westin, Hilton, the Spanish chains NH and Tryp and the highly rated Hospes Palau De La Mar.